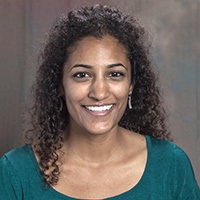 Aarti Sekhar, MD, is Associate Professor in the Department of Radiology and Imaging Sciences at Emory University School of Medicine. A board certified interventional radiologist, Dr. Sekhar specializes in image-guided interventions including CT and ultrasound-guided procedures such as biopsy of lung and abdominal/pelvic masses, fiducial marker placement and abscess drainage. She works closely with colleagues in gastroenterology, urology, surgical oncology and general surgery to provide expert image interpretation of abdominal and pelvic MRI, CT, ultrasound, and x-rays for patients with gastointestinal and genitourinary cancer. Dr. Sekhar serves as co-director of the Emory Global Health Initiative which includes a collaboration with Black Lion Hospital in Addis Ababa, Ethiopia. Dr. Sekhar received her medical degree from University of Massachusetts in Worcester, Massachusetts. She completed her residency and a fellowship in abdominal imaging and intervention at Beth Israel Deaconess, Harvard Medical School in Boston, Massachusetts.